Spring is many Houstonians favorite season of the year. It’s not too cold to eat outside or walk around the park, but it’s also not purgatory level hot either. Texas can be pretty brutal when it comes to the summer heat, so while it’s still fresh—now is the perfect time to prep your HVAC system for the summer season with the number one AC Repair company in Houston—Airteam. Since we are experiencing unseasonably cold temperatures the past few days, many Houston homeowners tend to put HVAC tune-ups and summer prep on the backburner. Here is the problem with that— Texas weather shifts gears on a dime! In Houston that means spring will hit all of a sudden and flowers will bloom, pecan trees will start budding and pollen will fill the air. Yes, your allergies will kick in too. You can’t forget that HVAC not only heats and cools your home but it also filters allergens and pollutants out of the air. If you have dirty ducts and clogged filters—you could be looking at a lot of Kleenex, nasal spray and other allergy meds. Looking past the air quality, having a professional AC repair company in Houston such as Airteam regularly service your system helps maintain it’s peak efficiency and catch small problems before they turn into larger, expensive ones. An easy way to remember how often most households should change their air filter is to go by the seasons. In low dust environments, a filter should need to be replaced every 90 days, so remember Winter, Spring, Summer, Fall. Now, some homes have more dust, pet dander and other contaminants that would require the filter to be changed out more often such as every 30 days. The best practice is to make it a point to look at your air filter once a week to see if it is overly dirty. A dirty filter means dirty air and that leads to illness and allergy flare-ups, plus it makes airflow very tough and can cause your electric bill to spike. One of the best ways to ensure your air filter lasts longer and the air quality remains healthy, is to have the ducts cleaned by a professional every five years or so. When you call any AC repair company in Houston, they can test your ducts for cleanliness and leaks. Both dirty ducts and leaking ducts can choke a system and cause the air quality in your home to suffer. Speaking of ducts, if you find out you also have leaking ducts, don’t let that go unattended. You are wasting vast amounts of energy, and it drives your utility bills up. In most Houston homes about 20-30% of conditioned air escapes through busted seals, cracks and bad gaps in ductwork. 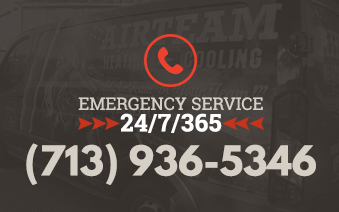 If your ductwork has leaked, you should call us and let us seal your ducts to keep that from happening again. Sealing your ducts and vents has shown to cut energy costs by as much as 20% in the Houston area alone. At least once a week you should walk outside and take a look at your unit and the area surrounding it. Do you notice any foliage overgrowth near the unit? Any high grass, weeds or debris? If so, you need to clear that area ASAP. It doesn’t take much for random trash, foliage, and other items to get into the condenser unit if never attended to. Clear away any debris within a 2-foot radius of the unit to ensure proper function and efficiency—plus it makes your unit easily accessible to our technicians for service calls. Indoors, make sure there is nothing is close to the vents, registers, or the air handler that could obstruct airflow. You can go ahead and take that leap into the Smart Thermostat arena. While buggy in their early introductory years, smart thermostats have come light years forward in advancement, reliability, and accuracy. Smart thermostats offer various intuitive features that can learn your preferences, know when someone is home and needing AC, be controlled from your office, or on the road. When it comes down to it, a smart thermostat is the only way to go for maximum accessibility and customizable convenience. Signing up for our MVP plan of scheduled maintenance offers a critical impact to the longevity and reliability of your system. By having regular scheduled maintenance check-ups and tune-ups by our professional HVAC technicians, you can spot any wear and tear before it causes a big problem. Contact us today to sign up for our MVP service plan to make sure your system runs at peak performance for years to come.